Eric DeCosta's world is unfettered by hobbies and male-bonding weekends. The Baltimore Ravens' new general manager adheres to a lifestyle that, in essence, is as basic as 1 plus 1. "He's all about the Ravens and family, and that's it," said his wife, Lacie. "He doesn't play golf, doesn't hunt, doesn't go on guy trips." 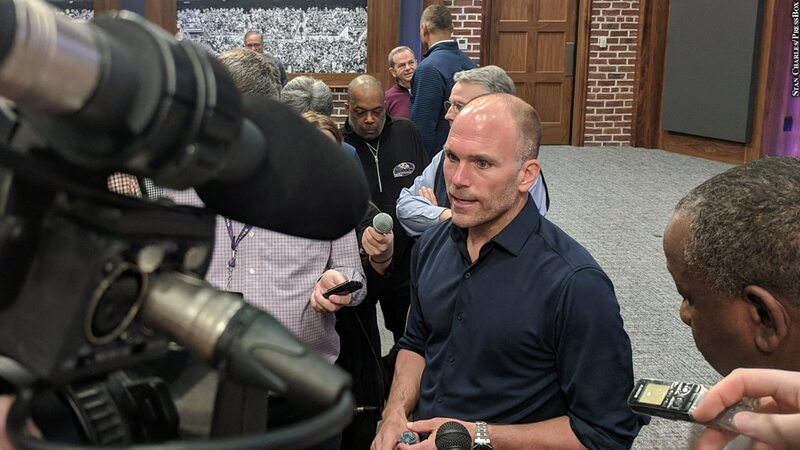 To make time for his two points of focus, DeCosta typically arrives at the Ravens' training facility before dawn, returns for breakfast with Lacie and their three children, then heads back to work. He works until dark, but has never once slept at the office. "My mindset is, do what you have to do and then get home before the kids are asleep," DeCosta said. "It's important for me to talk to them, ask them how their day went, what they're working on, how school went, encourage them. Also, it's also important to me to spend time with Lacie. We usually eat dinner together, even if it's 9 o'clock or 10 o'clock at night. She'll wait for me." 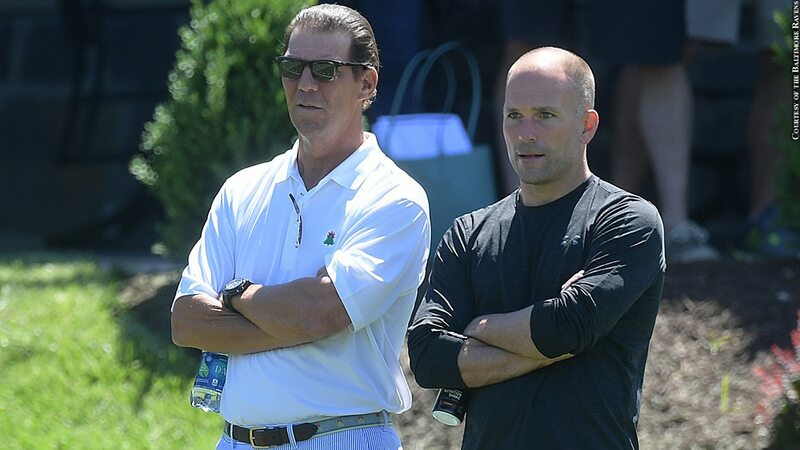 This tireless work ethic is one reason why Ravens owner Steve Bisciotti chose DeCosta to succeed Ozzie Newsome, who had held the job since the Ravens came to Baltimore in 1996. "I see myself as a force of energy," said DeCosta, who turned 48 April 10, a little more than two weeks before overseeing his first NFL draft. "I don't sleep that much and try to balance my time the best I can. When I'm home, I try to be the best husband and father I can be. And when I'm in the office I'm trying to work -- other than pull a practical joke every once in a while." Ah, the practical joke. Known primarily as an exceptional judge of talent and an inspirational leader, DeCosta is also a rascal whose antics are legendary among his peers. DeCosta's favorite prank victimized Pat Moriarty, the Ravens' senior vice president of football administration. DeCosta can't tell the story without giggling because, well, it's hilarious. "Pat came in one day with a new pair of jeans, the same kind I happened to be wearing," DeCosta said. "I have about a 32-inch waist and he's probably like a 36. While he's working out, I exchanged my jeans for his and hid around the corner." Moriarty was talking to front office official George Kokinis as he struggled to don the jeans. The switch was especially effective because DeCosta -- a stickler for detail -- slipped Moriarty's belt into the smaller pair of pants. "I hear Pat say, 'Gosh, have I gained that much weight? I feel really bloated. I didn't even eat that much at lunch!'" DeCosta said. "I looked down and saw the pants legs were up over my ankles, close to the calf. Then I knew. That son-of-a-gun Eric was at it again." Turning the tables on DeCosta doesn't usually work. One time, his sister-in-law got access to his office and buried it in balloons, ribbons and embarrassing child photos prior to a planned birthday celebration at the team complex. "Of course, Eric was the first one in the office. By the time everyone else got there, he had cleaned everything up," Lacie said. "And he said nothing about it all day." Come April 25, DeCosta will assume the role that Newsome filled masterfully for 23 seasons. As Newsome's successor, DeCosta will have the final say on Baltimore's draft picks. It's arguably the most significant facet of a job DeCosta wanted long before he joined the Ravens in an entry-level position in 1996. "I love the draft. It keeps me up at night," DeCosta said. "It's been like that since I was 10 years old. I used to sit on the couch and read Will McDonough's column and look at his mock draft in The Boston Globe. I get excited. It gives me a sense of energy, and I'm going to approach this draft as if it's the most important thing in my life." After taking the job in late January, DeCosta lost linebackers Terrell Suggs, C.J. Mosley and Za'Darius Smith to free agency but signed running back Mark Ingram and safety Earl Thomas. Now he's got to fill out the rest of the roster, with an eye on pass rushers and wide receivers. "It's an opportunity for us to get better quickly. We've got some really good picks," DeCosta said. "We know how to do the draft. We've got the best scouting staff in the league, and I've got an adviser in Ozzie who's probably renowned as the best drafting GM in the history of the NFL." In his quest to build a Super Bowl contender, DeCosta will rely on input from Newsome, head coach John Harbaugh and the scouts. But now DeCosta is the one making the decisions, and he has no intention of merely following an old set of rules. "I'd like to think I'll be innovative, aggressive and creative. I intend to question things we've done in the past and question why we did it, what we can do to improve and what are the areas we need to exploit to make us better than our opponents," DeCosta said. "If you just do the same things all the time the same way, they're going to catch up to you and beat you. You've always got to stay ahead." 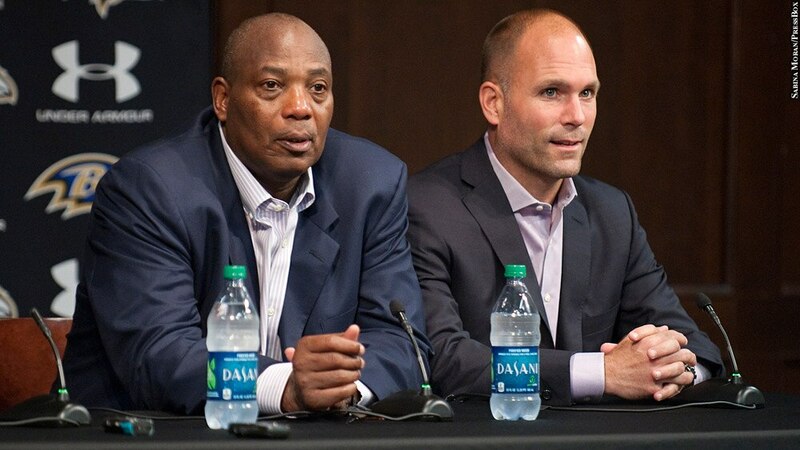 Working closely with Newsome for years provided DeCosta with the tools to become an NFL general manager. That insight is only one facet of DeCosta's qualifications for this extremely demanding job. "A lot of successful scouts go on to better things," Moriarty said. "But to make it to general manager, you have to have some leadership qualities and the drive to succeed. Eric has sincere enthusiasm. You can't fake that. He's passionate, he loves competition, he loves what he does. And it's contagious." Kirk Ferentz, now the head coach at Iowa, was an assistant coach with the Ravens when DeCosta joined the team. They jogged together and spoke often. Even then, Ferentz saw DeCosta's potential to make it big. "The thing about Eric is he's highly intelligent, but on top of that he was very eager and remains that way," Ferentz said. "Eager to learn, listen, look, watch what other people do. Seems like people who have that ability tend to move forward in whatever profession they're in." DeCosta was promoted to the Ravens' Midwest area scout in 1998, climbed into the role of director of college scouting in 2003, became director of player personnel in 2008 and ascended to the role of assistant general manager in 2012. As word of DeCosta's ability leaked outside Baltimore, several teams were interested in interviewing him for their GM jobs. The Massachusetts native politely refused because he had his heart set on remaining in Baltimore with Lacie in her hometown -- and his new favorite city. "Lacie wants what's best for our family, but she also wanted me to be challenged and she wanted me to be valued and feel like I'm fulfilled," DeCosta said. "Fortunately, my relationship with Steve and Ozzie provided that. I never felt as if this was a waste of my time." Bisciotti talked to DeCosta about ultimately replacing Newsome in 2007, and DeCosta immediately began preparing for the switch. "When Steve asked me to be his GM way back then, I was extremely flattered and I knew he would stick to his word. So I told him I was in," DeCosta said. "I tried to use that time to learn and to work and to observe Ozzie more closely. "Then, around 2013, it became more apparent that it would be around this time . I felt like I was on the clock. Everything got ramped up. I spent more time making connections with agents, talking about contracts, looking at how other teams operated. Things like the salary cap, analytics, the non-traditional scouting things that we do, those become priorities for me. Even though I was frustrated that some of my peers were getting these GM jobs and I wasn't, I looked at it as a unique opportunity to get the most amazing on-the-job training." Having a job in Baltimore means never having to rush home to be with Lacie, who has plenty of things to keep her occupied. "Her mom lives here, her sisters, her relatives. Having that support allows me to work a little bit more," DeCosta said. "Had I been in Green Bay or Seattle or the New York Jets, it would be a different dynamic. It would be challenging in a lot of different ways. Here, I can enjoy what I do while she's enjoying this community where she grew up with support she may not get in another city." "The jury is still out on that one," he said with a grin. As the team captain of the football team at Colby College in the early 1990s, DeCosta carried the unimposing nickname of "Smurf." "He was a bit undersized as a linebacker, maybe 5-foot-10, 180 pounds on good days," said his former coach, Tom Austin. "But he had such intensity and a love for the game. Extremely competitive, dean's list student. His detail of assignment was unmatched. He would spend extra time looking at an opponent's film and preparing. That's what made him a success in the pro world, his knowledge of what needs to be done." Austin said DeCosta's class compiled the school's best record across four years since the 1960s. After he started working with the Ravens, DeCosta was asked by Austin to talk about the finer points of evaluating game film. He showed up with three huge notebooks, one for the quarterback position alone. "That's Eric DeCosta," Austin said. "He goes full bore at whatever he's doing." At the news conference announcing his ascension to GM, DeCosta cracked up the crowd with the story of how he served as errand boy for head coach Ted Marchibroda. He told of getting $100 to take the coach's car for an oil change, getting the $9.99 special and pocketing the rest. DeCosta would do anything for Marchibroda, who was a friend and mentor. So when Marchibroda asked DeCosta to drive him to Buffalo, N.Y., for a funeral, giving him all of two hours advance notice, DeCosta -- who at the time was still single -- got behind the wheel and headed north. "He told me stories the whole way about his life, where he grew up, his teammates," DeCosta recalled. "We got to Buffalo and met up with some of his teammates. They're old, and here they are telling stories and I'm this 26-year-old kid just listening. After a long night, we got back to the hotel, and at 4 o'clock in the morning Coach is doing calisthenics." They went to the funeral, where DeCosta's job was clearly defined. "Coach was bad with names, so I'd be in front of him and when someone would approach us, I would introduce myself and they would say their name," DeCosta said. On the ride home, Marchibroda had more stories to share. "When you take Coach Marchibroda on a trip like that, that's a nice piece of time in the car with someone who has a lot of wisdom and a lot of knowledge about the National Football League," Ferentz said. "That was one more learning opportunity." Years later, in the wake of a disappointing loss to the Indianapolis Colts at home in a playoff game, DeCosta was in a dour mood when someone tapped him on his shoulder. "It was Coach Marchibroda. He says, 'Hey Eric, what are you doing right now?' I was in a really bad mood, and he says, 'What do you say if we go to Phillips and get a crab cake?'" DeCosta recalled. "I looked at him and said, 'Coach, let's go.' We went there, and it kind of took me back full circle, what he meant to me and what it meant to be part of that first era of the Ravens. We didn't have the best facility and we didn't have the best team and we didn't have the best equipment, but we had great relationships." DeCosta figures the journey he's taken to this point in his life is going to pay off in a big way. "I'm going to have people working with me who I know have my back," he said. "I know this organization and the owner knows me, so I think I'm going to be set up to succeed rather than fail." He's got an avid supporter in Moriarty, the focus of many of DeCosta's jokes and yet, the godfather of one of his children. "I've been looking forward to this for a long time," Moriarty said. "It's going to be a lot of hard work, but it's going to be fun. Eric has such a perfect mentor in Ozzie Newsome. You couldn't ask for a better teacher. But on the same token, Eric is also Eric. He doesn't try to be an Ozzie Newsome. Eric will come up with something that no one's thought about, and the next thing you know you're trying to make it work." Best of all, DeCosta is doing it with the Ravens. "I can't imagine it would mean the same to him if he was someplace else," Lacie said. "I'd follow him anywhere, but it's a dream come true to be in Baltimore to see him fulfill his lifelong wish." Former NFL vice president of officiating Mike Pereira says making pass interference calls reviewable is going to "see the game change … in a negative way."